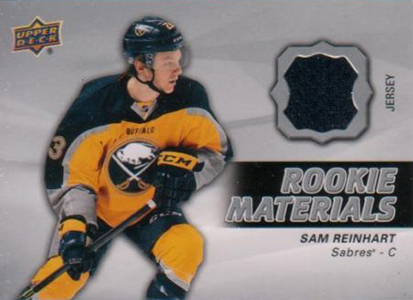 2014-15 Upper Deck Series 2 Hockey stays in line with its other half that was released earlier in the season. While a lot of the chase will focus on the expanded roster of Young Guns rookie cards, there is lots of other content to round out one of hockey's annual cornerstone releases. Like Series 1, the base set has 200 cards. This doesn't include short prints. Collectors should expect 50 more Young Guns, but that ultimately depends on how the season pans out and the number of players making their NHL debuts. Two that will be there are Jonathan Drouin of the Tampa Bay Lightning and Washington's Andre Burakovsky. Young Guns are inserted 1:4 packs, which means hobby boxes should yield six of them. 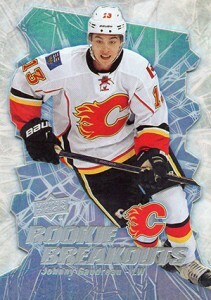 Parallels for both the main set and the Young Guns include Exclusives (#/100) and High Gloss (#/10). 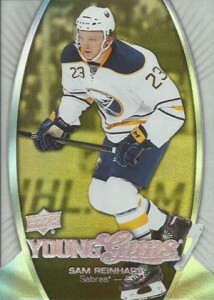 Printing Plates for the Young Guns are also randomly inserted. UD Canvas cards return as large insert set that's almost like a parallel. Combining to land 1:6 packs, the set comes in multiple tiers: base (1:7), Young Guns (1:48), Team Canada/Program of Excellence (1:192), and Retired Stars (1:192). 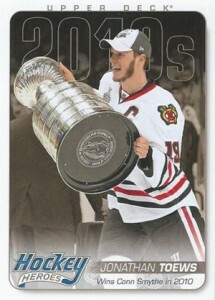 The perennial Hockey Heroes line reaches the current decade, focusing on the top players from the 2010s. Landing two per box, the header and Art Card are once again tough short prints. Both are inserted 1:592 packs. The Stanley Cup's off-season world tour continues in Day with the Cup (1:1728) as it travels with members of the Los Angeles Kings. UD Portraits takes the insert slot held by Shining Stars in Series 1. The set has several levels including Veterans (1:9), Rookies (1:24) and Legends (1:72). Parallels come in the form of Gold (Rookies #/99, Veterans and Retired Stars #/25) and Platinum Blue (Rookies #/25, Veterans and Retired Stars #/5). 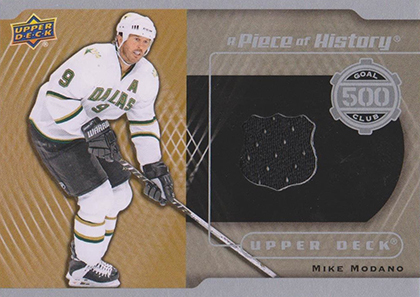 2014-15 Upper Deck Series 2 Hockey hobby boxes deliver a pair of memorabilia cards. Rookie Materials (1:24) and UD Game Jerseys (1:24) are the most common. Both have patch versions numbered to 25 or less as well. Carrying over from Series 1 are 1,000 Point Club Jerseys (1:720) and 500 Goal Club Jerseys (1:2,160). Signed versions are tough with 1,000 Point Club Autograph Jerseys numbered to 10 and 500 Goal Club Autograph Jerseys numbered to 25. Additional signed cards in 2014-15 Upper Deck Series 2 Hockey come in the form of UD Signatures (1:420) and 1990-91 25th Anniversary High Series Buyback Autographs. 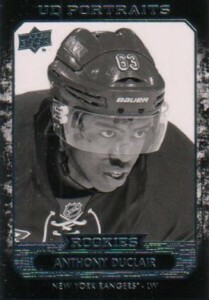 Rounding out the product are O-Pee-Chee Update cards that add rookies and traded veterans that weren't available when the original was released. Rookies land 1:7 packs while veterans are 1:17. 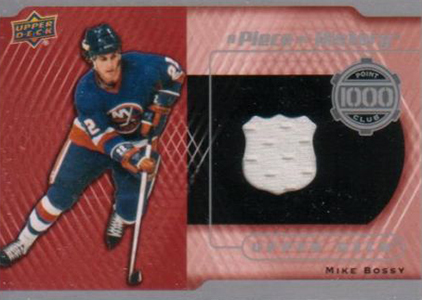 Parallels include Retro (Rookies 1:17, Veterans 1:42) and Red Border (Rookies 1:336, Veterans 1:840). 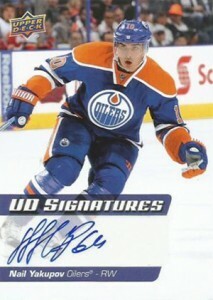 OPC Update Signatures (1:1,040) are also brought over to 2014-15 Upper Deck Series 2 Hockey. 250 cards. 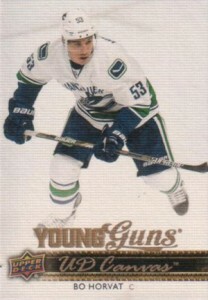 Cards #451-500 are Young Guns short prints inserted 1:4 packs. 49 cards. Insertion rates not announced. 4 cards. Insertion rates not announced. 14 cards. Inserted 1:12 hobby, 1:12 retail, 1:24 blaster, 1:12 fat, 1:12 tin. 1 card. Insertion rate not released. 2 cards. Inserted 1:2,160 Hobby. 42 cards. Inserted 1:24 hobby, 1:48 retail, 1:480 blaster, 1:48 tin. 39 cards. Inserted 1:24 hobby, 1:48 retail, 1:480 blaster, 1:48 tin. 60 cards. Inserted 1:9 hobby, 1:12 retail, 1:24 blaster, 1:12 tin, 1:12 fat. Legends (#P41-P45) inserted 1:72 hobby, 1:96 retail, 1:192 blaster, 1:96 tin, 1:96 fat. Rookies (#P46-P60) inserted 1:24 hobby, 1:32 retail, 1:64 blaster, 1:32 tin, 1:32 fat. 28 cards. Inserted 1:420 hobby (Group A - 1:63,420, Group B - 1:4,230, Group C 1:1,410, Group D - 1:705. 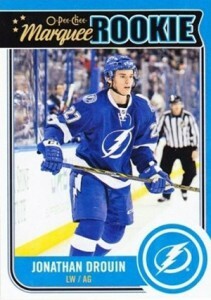 Veterans (#U1-U12) inserted 1:17 hobby, 1:17 retail, 1:33 blaster, 1:17 tin, 1:17 fat. Rookies (#U13-U42) inserted 1:7 hobby, 1:7 retail, 1:13 blaster, 1:7 tin, 1:7 fat. 14 cards. Inserted one per tin. 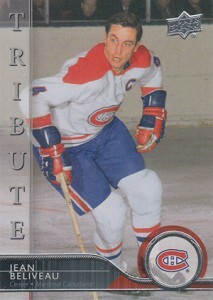 Covers the High Numbers from 1990-91 Upper Deck Hockey (#401-550). A full checklist can be seen here. The list below is for players whose buybacks are autographed. These players do not have unsigned buybacks. First off for the Upper Deck Series of give it a rating 5 stars because, the Upper Deck Series franchise has been putting smiles on people’s faces especially mine. The Upper Deck company has been putting in work on the technology and design they use on these cards, comparing from way back in 2005-2010, Im really impressed and delighted to see how the base cards, inserts and relic cards came out this year in UD Series 1. I started collecting since last year and I remember the first pack I bought of hockey cards it was UD Series 1 13/14 and I completely got all base cards haha. But you see that’s the fun of it the excitement on what you think you might get. im really proud of Upper Deck and the series that they make every year it’s new, original, new faces, and different inserts. As of date I completed the 13/14 UD Series 1 checklist with every card, insert, exclusive, and relics, except for the buyback auto cards which is a bummer. But all in all the UD Series is my favourite product by far! I’m in the same boat as you Joel. I have all the cards aswell Exclusives 1-250 , Shining Stars Royal Blue 1-40, etc. except the 25th Anniversary, I was gonna try and get them all too, but I stopped at around 50-60 of them. Having only looked thru the checklist at this point, this is a 4-star product for me right now. I think the checklists are all fairly solid, even the Canvas, and I’m intrigued by the Portraits. There are more than a handful of the harder-to-pull cards that I’d love to get, like a few of the 500-Goal and 1000-Point Club cards and the Bure Young Guns autograph!! I’m also not really liking the inclusion of the O-Pee-Chee Updates in Series 2. 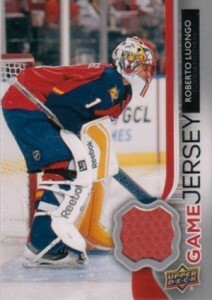 Maybe Upper Deck could cut the OPC set down and make a 300-card Series 1 and a 300-card Series 2 instead? At the least, perhaps UD could have made the OPC Updates some kind of special chrome/holofoil cards and included them with the OPC Platinum to be released later this year? I don’t know how that all works on the business side of things, that’s just my 2� as a collector. For me, the OPC Updates in Series 2 almost cheapen Series 2, in a way. series 1 and 2 together would still not be 25% as good. I think series 2 young guns list is better than series 1 this year. Some other very good upside ones as well. 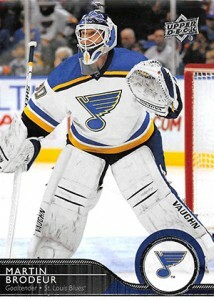 Any chance we can get the groupings for the game jersey’s and rookie materials? Eric � No groupings were on the checklist from UD for these. 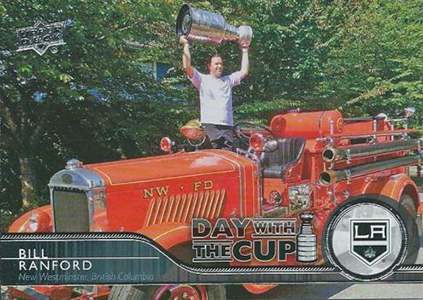 Looks like along with the unannounced (but expected) Acetate Series 1 Young Guns cards, there are also ‘Day With The Cup Flashback’ cards. 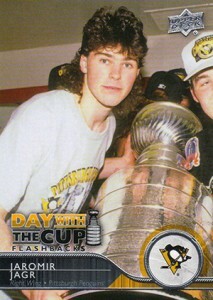 So far I’ve seen eBay listings for Ron Francis and Mario Lemieux. Has anyone else seen others out there yet? Also hearing rumblings that the Pastrnak Young Guns could be something of a SP? Dave71120 � Yes, we did a post on the DWTC Flashbacks earlier today. We’re still tracking how many there are. Like the post previous, I realize that things could be a bit of a disappointment compared to last year, but I would think for the 25th anniversary of a product, it wouldn’t feel like it was “phoned in”. It’s like driving all the way across country to Wally World, only to find out it’s closed. A lackluster grade for a lackluster effort. Barry and Joel, to complete 13-14 set with the, heroes, canvas do you buy from eBay or just breaking boxes? 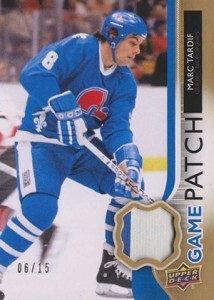 Loved opening a few of these Hobby Boxes, I agree that the O-Pee-Chee is a total waste and cheapens the series. 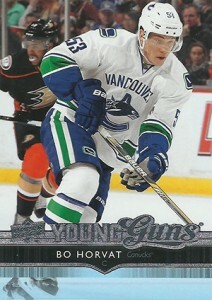 But the Young Guns are great, the Canvas cards are cool, and there seems to be a nice flow of inserts in each box. I both 2 tins and got a lot of good cards. 2 jerseys, 6 young guns, 1 young gun canvas, 5 marquee rookie, 2 rookie update, 3 canvas, 2 portraits, 2 hockey heroes all for 70$ lol. They didn’t have any hobbies in stock so both 2.